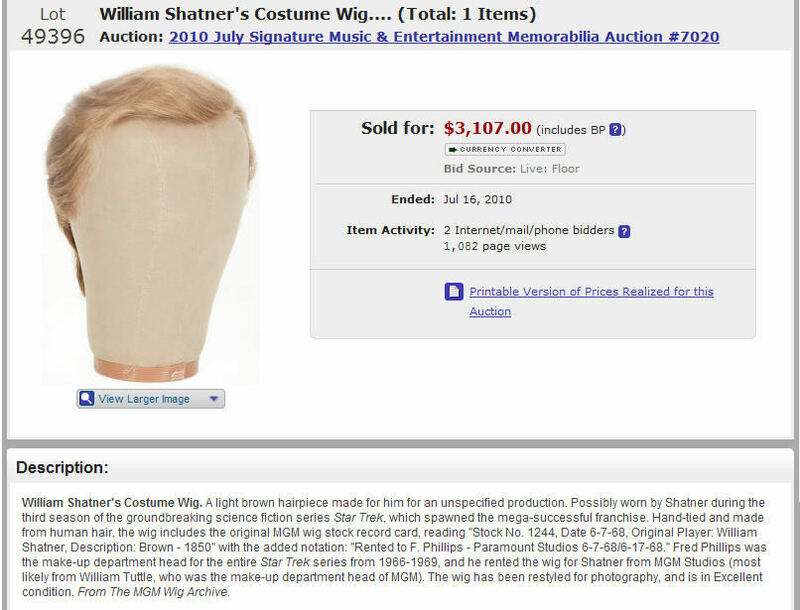 Star Trek Prop, Costume & Auction Authority: TOS William Shatner Costume Wig from "The Paradise Syndrome"
TOS William Shatner Costume Wig from "The Paradise Syndrome"
Presented below are some auction house photos from the July 17, 2010 Heritage Auction Galleries Entertainment Memorabilia sale of Lot 49396, a William Shatner costume wig which was described as "possibly worn by Shatner" during the production of Star Trek: The Original Series. 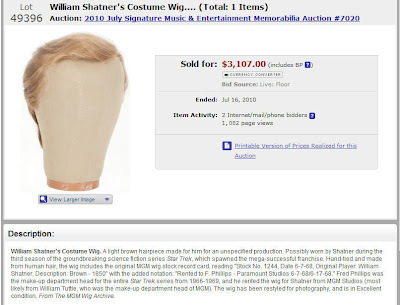 This lot realized a final sales price, including buyers premium, of $3107.00 and featured an original MGM wig stock record card noting that it was rented to F. Phillips of Paramount Studios from June 7th, 1968 through June 17th, 1968. Fred Phillips was the veteran, award winning Make-up Artist for TOS who is perhaps most well known for creating and applying the Spock vulcan ear appliances to Leonard Nimoy during the production of the series. 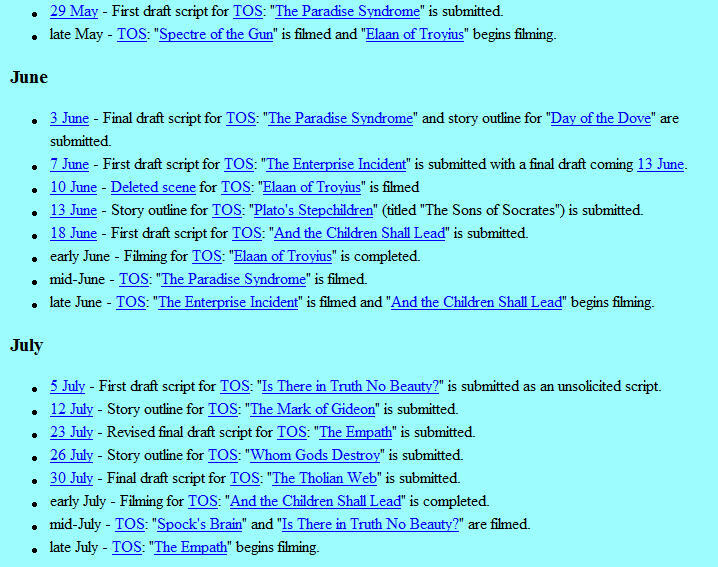 In an earlier post on this site, a detailed Filming Chronology for The Original Series was published - which is viewable at: http://www.startrekpropauthority.com/2010/07/star-trek-original-series-production_27.html Upon consulting this chronology, it can be seen that the 3rd season episode "The Paradise Syndrome" (first airdate: Oct. 4, 1968) was filmed during mid-June, 1968 on the Desilu soundstage - the timeframe indicated by the MGM record card. 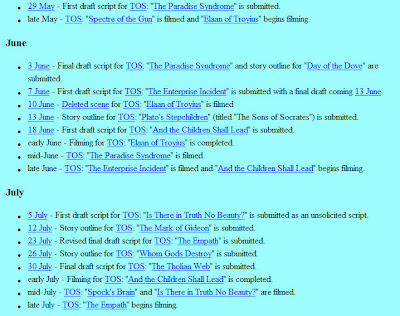 Ofcourse, the storyline of "The Paradise Syndrome" involves Captain Kirk being stranded on the planet Amerind and spending months living amongst the Native American-like tribe that inhabits a small village on the world. Over the course of the episode, in order to effectively simulate the passage of weeks and months, William Shatner's normally short Starfleet haircut is seen to grow significantly denser and full sideburns are evident in the closing scenes. 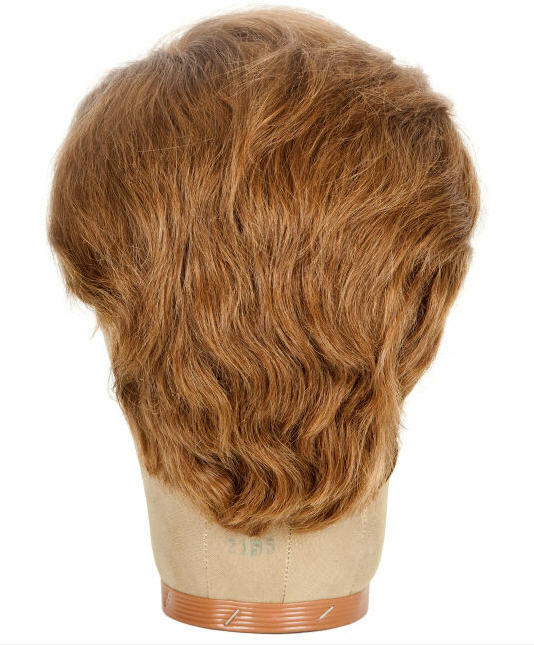 Thus, it is plausible and likely that this costume wig saw service on screen in TOS as part of the special makeup effects needed for the story. 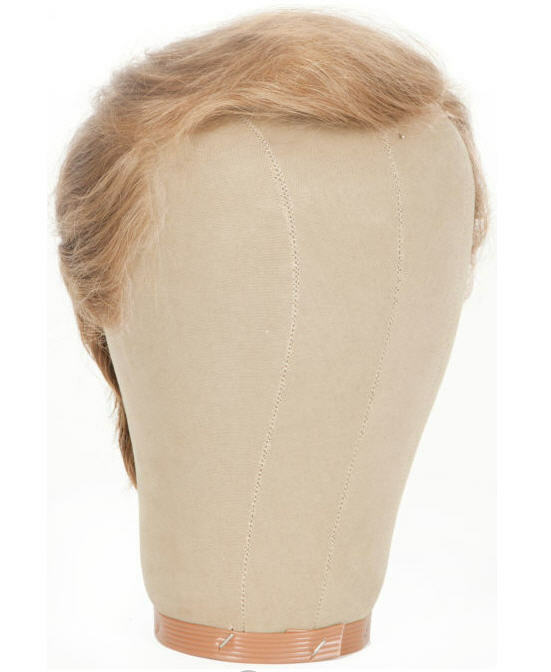 Some episode screenshots showing Captain Kirk's changing hairstyle are presented after the modern day images and an extract of the June/July, 1968 Original Series filming chronology.